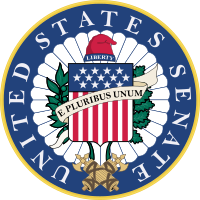 The Seal of the United States Senate is the seal officially adopted by the United States Senate to authenticate certain official documents. Its design also sometimes serves as a sign and symbol of the Senate, appearing on its official flag among other places. The current version dates from 1886, and is the third seal design used by the Senate since its inception in 1789. The use of the seal is restricted by federal law and other regulations, and so is used sparingly, to the point that there are alternate, non-official seal designs more commonly seen in public. The design has some similarities to Genius of America, the sculpture over the central east pediment of the Capitol building which had recently been completed. Made by Luigi Persico from 1825 to 1828, it also features three female figures, representing America, Justice, and Hope. Elements shared between the two designs include a July 4 pedestal, a scroll with a Constitution inscription, the scales of justice, and an eagle. Resolved, That the Secretary shall have the custody of the seal, and shall use the same for the authentication of process transcripts, copies, and certificates whenever directed by the Senate; and may use the same to authenticate copies of such papers and documents in his offices as he may lawfully give copies of. The seal of the President pro tempore of the United States Senate includes a representation of the original gavel, with several depictions even showing its cracks, along with two quill pens and elements from the official Senate seal. ^ a b c d e f g h i j "Senate Seal". United States Senate. Retrieved 2008-02-11. ^ a b c d e f g h i j k Saltonstall, Leverett; Frazier, Emery L. (1966). History of the Senate Seals. Senate document 164 of the 82d Congress, 2nd session. Government Printing Office. ^ a b c "Senate Ethics Manual" (PDF). Select Committee on Ethics, United States Senate. Retrieved 2008-02-11. ^ a b c "18 U.S.C. § 713 (c)". Retrieved 2008-02-11. ^ "Majority Whip Office Historical Facts". Archived from the original on 2007-08-05. Retrieved 2008-02-11. ^ This can be seen with snapshots taken at web.archive.org; it first appeared on October 31, 2002 and was used until late January, 2006. ^ "Senate Flag". United States Senate. Retrieved 2008-02-11. ^ "Robert F. Kennedy Commemorative Silver Dollar Fact Sheet". Retrieved 2008-02-11. ^ a b c "Historical Minutes: 1878–1920: Senate Seal". Retrieved 2008-02-11. ^ "First Realizations of the Great Seal". greatseal.com. Retrieved 2008-02-11. ^ "Indian Peace Medals". greatseal.com. Retrieved 2008-02-11. ^ In 1885, Senator William P. Frye remarked "The Senate is without any official seal. There is only a legend of one, three women very slightly clothed, but it is only a legend." (noted in the Congressional Record, vol. 17, p. 96.) The final report for the new seal, after the earlier seal had been found, then said "No one has yet ever discovered what these figures were intended to typify, or what relevancy they had to the United States Senate or its proceedings." (Senate Report No. 48, 49th Congress, 1st Session.) This confusion was probably aided by the worn condition of the seal, which obscured several features which would have made the meaning more obvious. ^ a b Marcus, Stern; Kammer, Jerry (2005-07-01). "Cunningham questioned over commercial use of congressional seal". Copley News Service. Retrieved 2008-02-11. ^ Margolis, Matt (2007-08-05). "Did Senator Durbin Violate Senate Ethics Rules?". Retrieved 2008-02-11. ^ "Eagle and Shield". United States Senate. Retrieved 2008-02-11. ^ For example, a PDF document about the Old Senate Chamber (PDF). ^ a b "Senate Gavel". United States Senate. Retrieved 2008-02-11. ^ "C-SPAN's Capitol Questions". 2000-07-31. Retrieved 2008-02-11. ^ "The Senate's New Gavel". United States Senate. Retrieved 2008-02-11. ^ "Senate Briefings: Frequently Asked Questions". Archived from the original on 2001-12-02. ^ "Traditions of the United States Senate" (PDF). United States Senate. Retrieved 2008-02-11. ^ "Hillary takes Senate gavel – for an hour". CNN. 2001-01-24. Retrieved 2008-02-11.